Last major update issued on May 30, 2010 at 04:55 UTC. The geomagnetic field was unsettled to minor storm on May 29. Solar wind speed ranged between 322 and 401 km/s. The high speed stream associated with CH406 appears to have arrived early on May 30. Solar flux measured at 20h UTC on 2.8 GHz was 73.7. The planetary A index was 33 (STAR Ap - based on the mean of three hour interval ap indices: 32.8). Three hour interval K indices: 43555433 (planetary), 32555423 (Boulder). 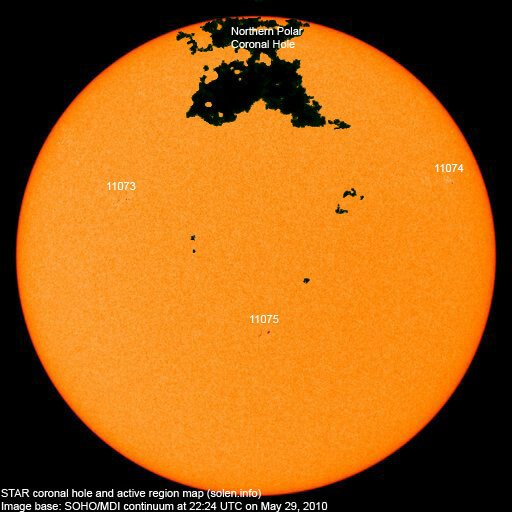 New region 11073 emerged in the northeast quadrant on May 28 and was numbered by NOAA/SWPC the next day. New region 11074 emerged in the northwest quadrant on May 28 and displayed little change on May 29. New region 11075 emerged in the southern hemisphere near the central meridian. May 26-28: No obvious Earth directed CMEs were observed in LASCO or STEREO images. A recurrent coronal hole (CH406) in the northern hemisphere was in an Earth facing position on May 28. CH406 has diminished over the last few days and could disappear soon. Processed SOHO/EIT 195 image at 00:00 UTC on May 30. The darkest areas on the solar disk are likely coronal holes. 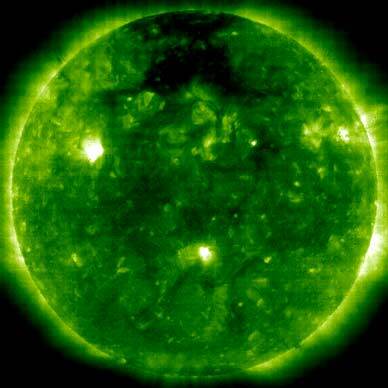 The geomagnetic field is expected to be quiet to minor storm on May 30-31 due to a high speed stream from CH406. Quiet conditions are likely on June 1-2.